Bands of heavy rain will make for a soggy day across the Garden State on Friday as temperatures stay definitively below normal through early next week. 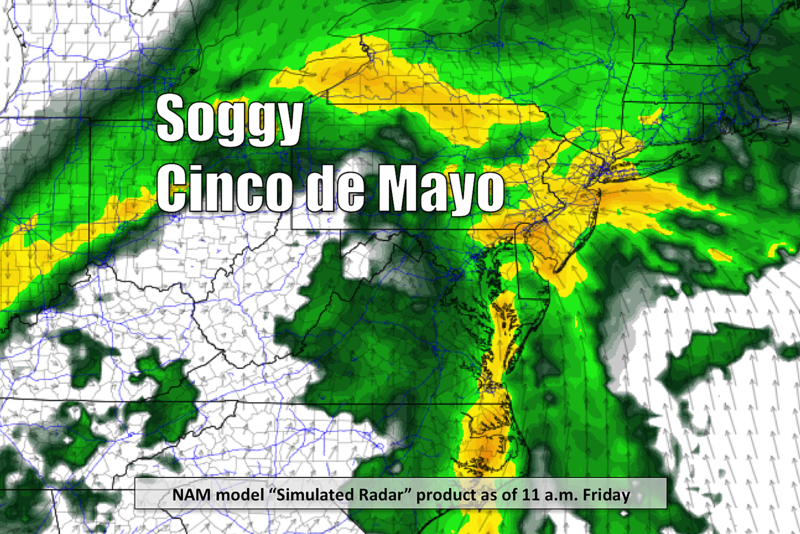 Call it soggy, miserable, yucky... or just plain wet! Most of Friday looks quite rainy for the Garden State, as a sizable, moisture-rich storm system traverses the U.S. East Coast. I expect a widespread inch of rainfall across New Jersey, with totals above 2 inches possible where it really pours. For clarity, and to help you plan your day, I've decided to break down the timeline of Friday's rain by region of the state. Keep in mind, these are only timing estimates, but should give you a sense of when the heavy downpours will begin end. --Far South Jersey (below the AC Expressway) — Rainfall will progress from showers to steadier rain after about 6 a.m. Heavier rain bands look to arrive from 8 a.m. onward. The raindrops really don't look to lighten up much until after about 1 p.m. The storm system will continue tapering to scattered showers by about 4 p.m. and most (if not all) precipitation should be done by 7 p.m.
--South-Central Jersey (between the AC Expressway and I-195) — Steady rain will move into this area by about 6 a.m. with heavier rain bands arriving after 9 a.m. Following several hours of steady downpours, the rain will begin to lighten up around 2 p.m., tapering to showers by 4 p.m. Most (if not all) of the rain should exit this area of the state by around 8 p.m.
--North-Central Jersey (between I-195 and I-78) — Steady-ish rain will be possible as early as 6 a.m., but truly heavy rain should hold off until about 9 or 10 a.m. It'll pour through the early afternoon, eventually lightening up around 2 or 3 p.m. We'll transition from rain to scattered showers by 4 or 5 p.m. before the rain largely ends by around 8 p.m.
--North Jersey (above I-78) — The rain will pick up in intensity in this area of the state through 10 or 11 a.m. Bands of moderate to heavy rain will persist through the middle of the afternoon, tapering to showers by around 4 or 5 p.m. Similar to the other regions of the state, the vast majority of rain is expected to exit by around 8 p.m.
Of course, we'll also have to be aware of the hazards of heavy rain too. Visibility will be severely reduced in the heaviest downpours. Ponding of water on roadways may lead to dangerous hydroplaning. Flooding of low-lying areas will be possible as well. While severe weather (wind, hail, tornadoes) is unlikely, a few embedded thunderstorms are certainly possible on Friday. Best chance for rumbles of thunder will be at the tail end of the heavy rain, in the afternoon hours, and in SW NJ (along the I-295 corridor). In addition to the rain, we'll have to contend with a brisk wind throughout Friday. Our latest forecast calls for sustained winds of 10 to 20 mph, with gusts to 30 mph. I think it's also important to note that as dry air moves in Friday afternoon, we may see the clouds break apart a bit through Friday evening. That will help temperatures spike upward several degrees just before sunset, peaking in the upper 60s to around 70 degrees in South Jersey. Friday night through Saturday morning could bring a few more on-and-off showers. With all the puddles on the ground, patchy fog is a pretty good bet too. Overnight lows will fall into the mid 50s. The overall forecast for the first weekend of May is cool. And occasionally damp. But really not too bad! For Saturday, on the backside of Friday's storm system, a few wraparound showers will be possible. I think skies will feature more clouds than sun throughout Saturday, and we'll hold on to a stiff breeze too. High temperatures are forecast to reach the mid to upper 60s. Again, not bad, especially if the raindrops end up missing your neighborhood — just a few degrees shy of normal for early May. Sunday will be drier, but cooler. I can't rule out an afternoon shower somewhere on Sunday. But we should see at least a little bit of sunshine through the second half of the weekend too. (I'll call it "partly sunny".) Sunday's high temperatures will be limited to the lower 60s. And then it gets even cooler for next week! Monday will be partly sunny and breezy, with high only in the mid 50s. Now we're talking about highs about 10 to 15 degrees below seasonal normals. That's more reminiscent of late March or early April. Tuesday looks cool too, with morning low temperatures tumbling into the 30s (frost/freeze alert) and highs again limited to the 50s for most of New Jersey. Hopefully we'll see a return to milder temperatures through the middle to late part of next week. But I do not see a sustained warmup coming in the foreseeable future, meaning the statistics for the entire first half of May will certainly end up on the cool side. Be safe and smart dodging raindrops on Friday, and have a great weekend!